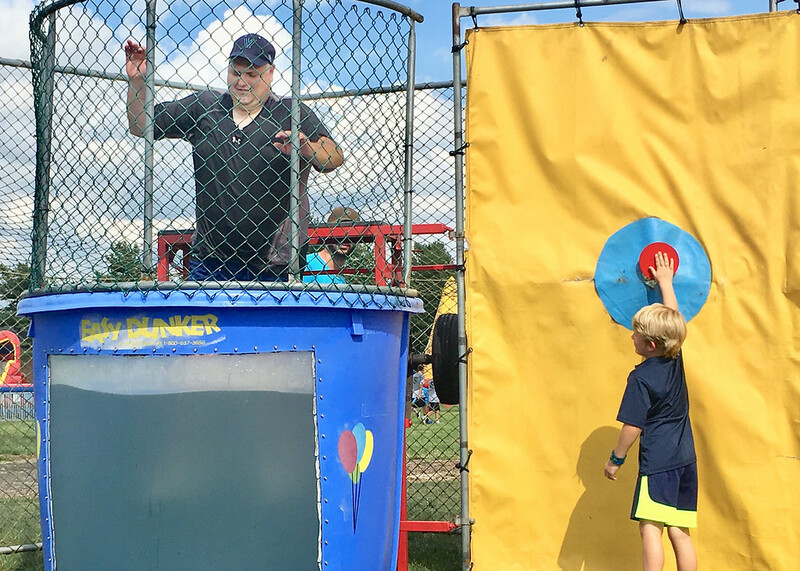 YARDLEY-MAKEFIELD >> Waving flags and cheering, thousands jammed Main Street in Yardley Borough on Monday to celebrate their freedom and to pay tribute to the men and women who died fighting to preserve it. Applause erupted from every corner of the street as veterans from American Legion Post 317 and Yardley-Makefield Veterans of Foreign Wars Post 6393 marched by carrying the American flag. Veterans from World War II, Korea, Vietnam and other wars joined the march either on foot or in a series of cars escorting them down the parade route. Among them was veteran Ed Torres, who served as Memorial Day bugler for many years. He waved to the crowds from inside one of the vehicles. The parade continued with the VFW and American Auxiliaries and their respective poppy queens. Also joining the march and firing their muskets along the route were re-enactors representing the Revolutionary War era and the 14th Continental Regiment. Their leader, Frank Lyons, the owner of the Continental Tavern, portrays John Glover in the annual reenactment of Washington's famous crossing of the Delaware River. 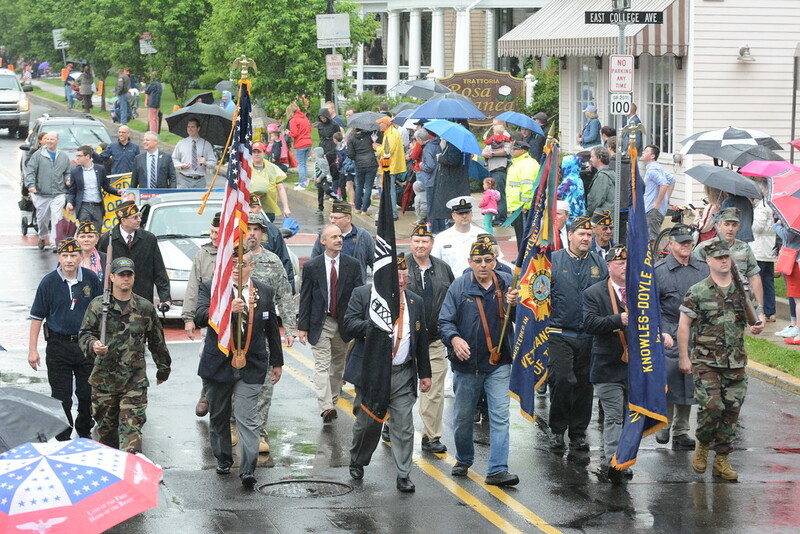 Yardley-Makefield >> Despite Monday’s inclement weather, hundreds of people grabbed their rain gear and headed to Main Street on Monday to honor the men and women who have given their lives in defense of freedom. 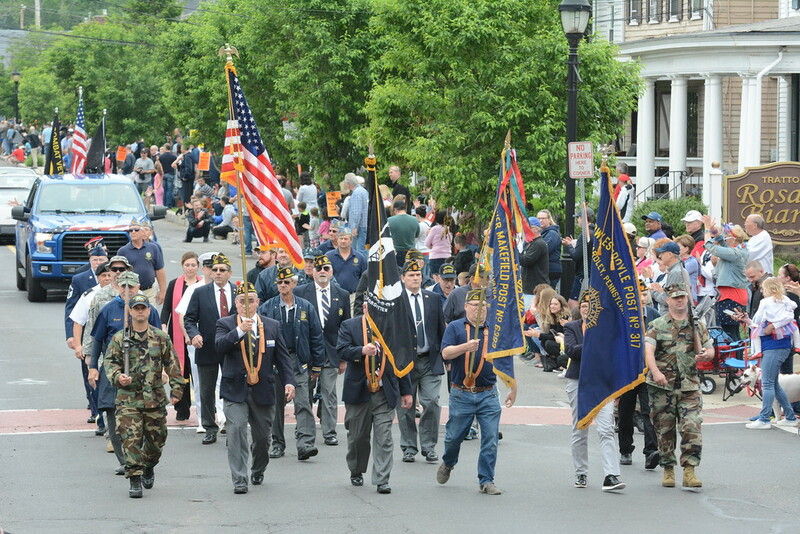 As the town’s annual Memorial Day Parade stepped off with a patroitic flourish of red, white and blue and with light drizzle turning into a heavier shower, cheers and applause erupted as the local veterans marched down Main Street. The veterans, some of them wearing their dress uniforms and all of them wearing red poppies, paraded proudly down the street waving to the unexpectedly large crowd. Their day began early with visits to area cemeteries and memorials where they led solemn salutes in the damp morning air to the area’s fallen soldiers. A formal ceremony followed at the Veterans Memorial at East Afton and Delaware avenues where speakers recalled the sacrifices that paid for the freedoms enjoyed today.